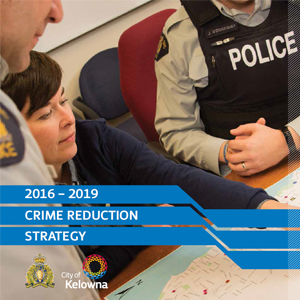 Policing services for the City of Kelowna are provided by the Royal Canadian Mounted Police (RCMP) and guided by the crime reduction strategy. The RCMP have proudly served Canadian communities for more than 130 years, establishing a reputation as one of the most respected police forces in the world. Check out the Kelowna RCMP webpage for more information. The City of Kelowna and commissioned NRG Research Group to conduct a telephone survey to 300 randomly selected residents in Kelowna in early 2019. The results will be presented to Council on Monday, April 15 at 1:30 p.m. in the Council Chambers. Results are generally positive and nearly all residents feel very safe or somewhat safe in their neighbourhood during the daytime (99%) and in their residence during the daytime (98%). Open-ended responses from respondents mentions low crime rates as the primary reason for why they feel their neighbourhood is safe relative to others in the city. See the full report for details. Kelowna RCMP have moved into the new Police Services building located on 1190 Richter St. The centralized detachment will significantly improve efficiencies and effectiveness of police services in Kelowna and provide flexibility for long-term growth. The RCMP’s operational model will continue to support several smaller satellite Community Policing Offices to provide some decentralized neighbourhood functions (e.g. public reception, criminal records checks, etc.) and increased police profile through Kelowna’s 214 square-kilometre geographic area. We take crime prevention seriously, investing one-quarter of tax dollars in Police Services and fostering a good reporting relationship with the RCMP. to effectively communicate public safety. Our 2018 Citizen Survey ranked concerns about crime relatively low, while noting Police Services as one of the primary strengths. Eighty-seven per cent of survey respondents said they felt the city was safe.